Any hoo a blog is a bit like child birth..doesn’t come till its ready..(obviously without the excruciating pain, gas air and copious amounts of drugs..but hey its a simile).. so here it is….sorry it wasn’t sooner…just been ever So just a tad stressed over the last week… and so stress week from that awful place over and I am back, my dreams are back – so I have dreamed what I am doing for the NEC in March for the ICHF and Room 6…. which I was panicking about ever so slightly..loads of ideas but nothing talking to me ( ever get that?) but I’m there now …just got a display issue but am sure it will come to me and also yesterday the fabulous Liss in StitcheS came to my rescue with this marvellous Christmas deco…all from an old book…hope the boy wonder doesn’t get to it and chop it up like he did with the last deco I made. 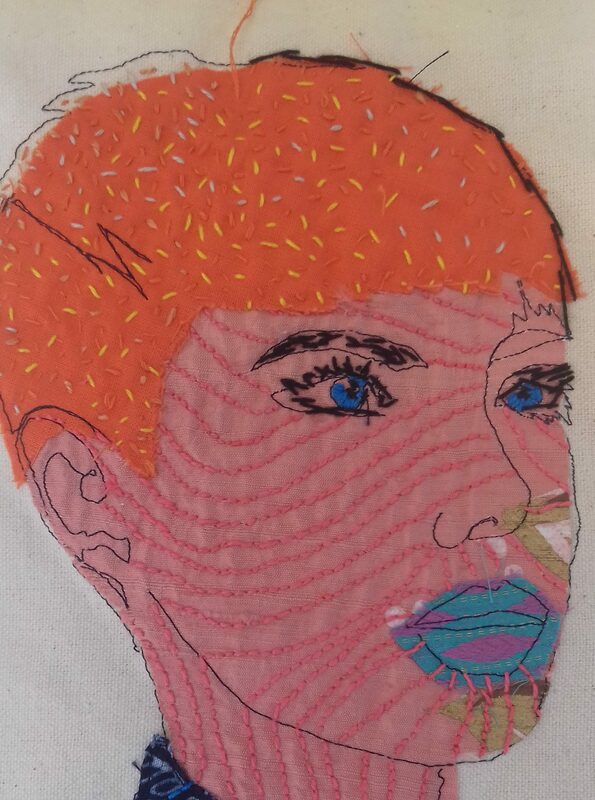 …..where do I start…another amazing week with the Embroiderer’s Guild…think the graduate show case looked even better than it did in London. Really enjoyed my stint with ArtVanGo. My mini sculptures had their first outing…by the Sunday they had had enough as they kepy voluntarily jumping off their box,,,they where ready for home too, me thinks! (now on sale in Stuff...see later in this blog). abandoned her to a mini cab driver in Kennington and then pushed back down the A3..to Petersfield only nearly fell asleep once… honest..home at 2am..phew…..
and finally (honestly) talking of online…. more shopping…. mycathasniceboots ….please like my page..you can get to it by clicking the link on my other page of this blog or if you click this link or type in http://mycathasniceboots.bigcartel.com it should come up…not sure how I do the liking thing independently..??? I am trying to get better at this…but I have actually started selling..somehow!! Decided to make my website bigger so will add more stuff soon. Anyway off home now been working all day have two days to myself to get making and the creative juices are flowing again…thank goodness! PPS if anyone other than Sarah makes it this far..well done I am truly amazed…and thank you for putting up with my drivel …….. Previous PostPrevious happy new bleuurghhhh!